PORT CANAVERAL — The ocean-sailing ship that transports rocket stages from United Launch Alliance’s factory to U.S. launch sites completed its latest voyage overnight, pulling into port to deliver the Atlas 5 that will send a cargo freighter to the International Space Station in March. The Mariner, owned and operated by the Foss Maritime company, made a week-long voyage from the ULA production facility in Decatur, Alabama to Cape Canaveral, Florida. Originally built to carry Delta 4 rockets for Boeing to the Cape and Vandenberg Air Force Base, California, the Mariner now also delivers Atlas 5 stages for ULA whenever circumstances permit. The Atlas 5’s original mode of transportation — the massive Antonov aircraft — continues to be used sparingly. The custom-made, purpose-built cargo ship entered service in 2000. The 312-foot-long roll-on/roll-off vessel has a crew of 16, carries over 100,000 gallons of fuel and is powered by engines derived from a locomotive. It features full living quarters, a kitchen and dining area, a fabrication shop below deck and even a helipad. Construction of the Atlas was performed inside the sprawling Decatur factory, followed by full testing and being readied for transport to Florida. The Mariner traversed 270 miles up the Tennessee River, 60 miles on the Ohio River and 646 miles down the Mississippi River. The trek then covered 815 miles through the Gulf of Mexico and around to Florida’s east-central coast to Port Canaveral. A trip’s round-the-clock average speed is about 12 mph. Now at the harbor in Port Canaveral, a semi-trucks will drive the 106.6-foot-long, 12.5-foot-diameter bronze-colored booster stage and 41.5-foot-long, 10-foot-diameter Centaur upper stage off the Mariner and up through Cape Canaveral Air Force Station on Monday. 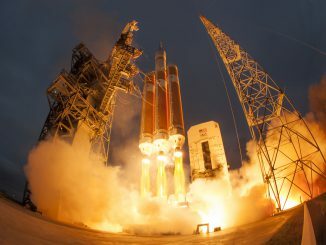 The first stage goes to the Atlas Spaceflight Operations Center high bay for receiving checks and the Centaur will be processed at the Delta Operations Center and integrated with the interstage and boattail. Later, the stages will be taken further up the road to the Vertical Integration Facility at Complex 41 for stacking aboard the mobile launch platform. 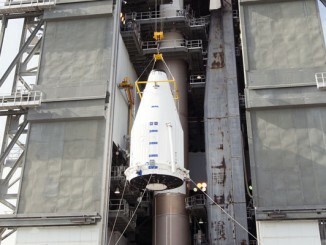 Once the first stage is erected, the interstage and Centaur will be hoisted and attached to complete the basic build up of the Atlas 5 rocket, designated AV-070. Installation of the encapsulated payload will occur about one week before launch to top off the 194-foot-tall rocket. 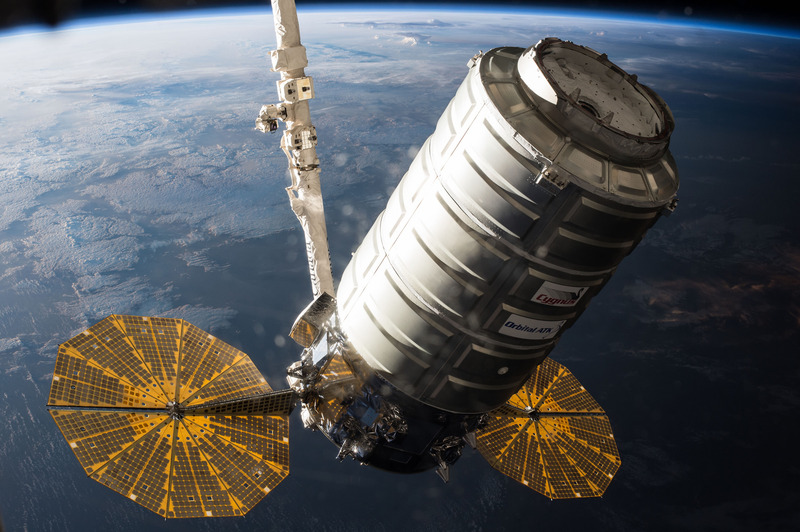 The mission, slated for March 19 at 10:56 p.m. EDT (0256 GMT), will launch the Orbital ATK OA-7 Cygnus spacecraft filled with 7,700 pounds of provisions and experiments for the International Space Station. The Atlas 5 rocket’s yaw-steering ability will enable a 30-minute launch window — extending 15 minutes before and after the instant when the station’s orbital plane passes over the pad. It will be Orbital ATK’s seventh resupply mission to the station under NASA’s commercial cargo-delivery program. The pressurized cargo module for Cygnus arrived at Kennedy Space Center’s Space Station Processing Facility on Jan. 9. The craft’s propulsion section arrived Feb. 1. The two pieces will be mated together and initial cargo loading performed at the SSPF before the Cygnus is moved to the nearby Payload Hazardous Servicing Facility for propellant loading and the stowage of late-load cargo items. Encapsulation of the ship in the Atlas 5 rocket’s 14-foot-wide, 45-foot-long extra extended payload fairing (XEPF) will occur at the SSPF, too. Previous Cygnus spacecraft have been given a ceremonial name for a former astronaut who has since passed away. The name for OA-7 has not yet been revealed. NASA requested that this Cygnus be launched aboard the Atlas 5 instead of Orbital ATK’s revamped Antares rocket. The switch allows the craft to carry a greater amount of supplies and gives the space agency better schedule assurance. 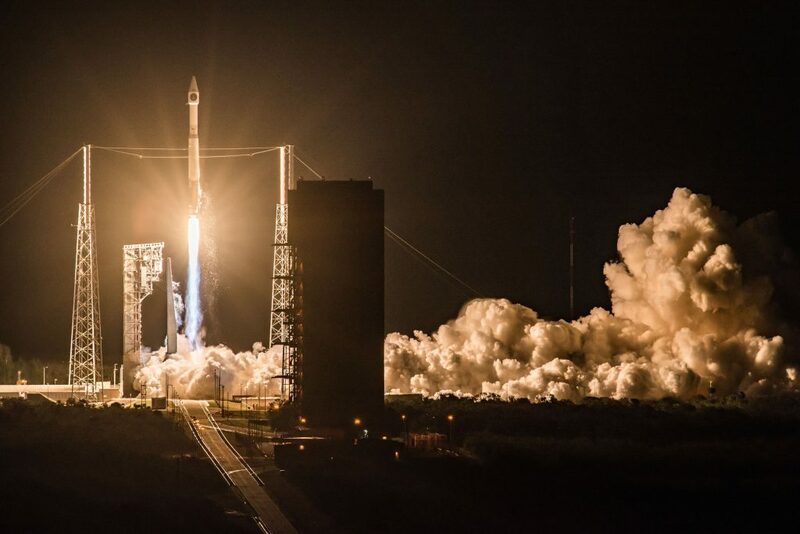 The Atlas 5 successfully launched two Cygnus missions — in December 2015 and March 2016 — while the Antares fleet was grounded to upgrade its engines from stockpiled Soviet-era powerplants to modern-day Russian ones. Among the science projects being launched in this upcoming OA-7 Cygnus include an Advanced Plant Habitat as a stepping-stone to food production systems on long-duration exploration missions, new tests on cell cultures in space for biological research, a technology experiment into coatings applied to container walls that could benefit fuel storage tanks, a host of cubesats that will be launched from the station, the third spacecraft fire test to study flames in microgravity and another try at collecting data during atmospheric reentry at the mission’s conclusion.